In this week’s behaviour focus post, Cats Protection Behaviour Manager Nicky Trevorrow explains why cats can suddenly attack. Sometimes when I fuss my cat they seem to be enjoying it then suddenly attack me! Why? Many people experience this with their cats and find it very confusing or upsetting as the cat appears to have asked for a fuss, only to then find that the cat shows ‘random’ aggressive behaviour. As we’ve seen in previous behaviour focus blog posts, cats don’t behave randomly or do things out of the blue, even if we can’t see a logical explanation. We need to look at things from the cat’s perspective, which can be very different to our own. 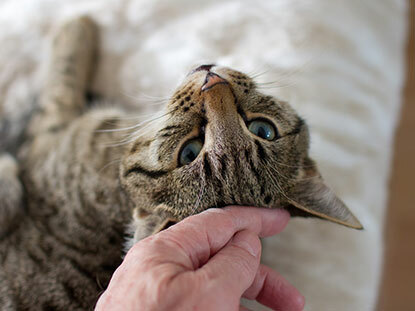 To be stroked by a human is not a natural behaviour for a cat to accept (they learn interactions with people during the kitten socialisation period) and some cats are more naturally reactive than others. This can also be directly related to the amount of human interaction the cat has had during the key sensitive period of two to seven weeks of age. The more positive interaction carried out during this time, the more likely the kitten will be well adjusted to everyday life and human interactions. Your cat may need to be able to feel more secure with physical attention. Sit quietly with them when you won't be interrupted and keep very calm. Keep interactions very short and stop before the cat reacts. Some cats don’t appreciate long cuddles and lots of stroking, and would prefer to spend time playing and running around so games and play are a better way of spending time with these kinds of cats than cuddles. Try not to provoke a reaction – stop stroking when you notice twitching or backwards-facing ears, dilated pupils or sudden tensing. 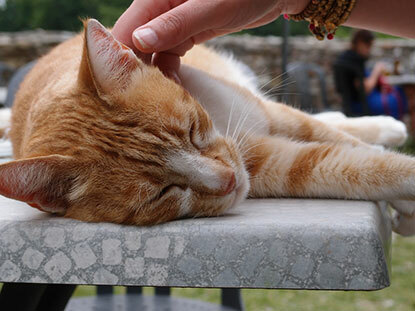 Reward the cat with a tiny titbit and praise for behaving in a relaxed way and then leave them alone. Never punish the cat, including verbal and physical punishment – this will only encourage further aggressive behaviour, especially if the cat has an underlying anxiety. As with any behavioural change, it is crucial to rule out medical problems, especially pain. Remember that cats are the masters of disguise when they are in pain so it can be really tricky to tell. If your vet says your cat doesn’t have any medical reasons that would cause him or her to be aggressive while being picked up or stroked, then here are a few behavioural tips with interacting with cats. All cats are individuals so some cats may seem to tolerate or in some cases, even appear to like be touched in some of these areas. However, as a general rule, cats don’t tend to be like being touched in these areas. It is a common misconception that cats that roll on to their backs and expose their belly want it to be touched. This behaviour is often seen after a period of separation and is used as a greeting. When cats do this they are communicating that they feel relaxed in the person’s presence, enough to expose such a vulnerable area. The best way to address this behaviour is to verbally acknowledge the cat’s greeting, which is all the cat needs. For a cat that is resting on the floor with their belly exposed, if someone really wanted to stroke the cat, I would recommend only stroking the head, or if you know the cat well, you may be able to stroke their neck and back too. In general cats like quite brief, low intensity interactions that are quite frequent. When cats greet each other in the same social group, it tends to be a brief head rub. Unfortunately, humans are the opposite! Our interactions are generally less frequent, but high intensity and prolonged. This is often another source of confusion. Even if the skin is unbroken, if the person experiences fever or headaches, together with localised swelling, redness, and pain soon after the bite, then medical advice should be sought urgently. If you are experiencing a behavioural problem with your cat, then firstly get your cat health checked by your vet and then get a referral to a qualified behaviourist such as the Association of Pet Behaviour Counsellors. Hi Sue, it sounds like the cat is fearful of another cat outside. Some cats respond to the close proximity of other cats by becoming very nervous or frightened and this may result in them being unwilling to venture outside. Being stuck inside can have other effects on their behaviour, such as toileting indoors, being more clingy, or showing more aggression. Cats that are frightened in this way may also develop abnormal behaviours such as overgrooming or over-eating. It is very difficult to discourage another cat from coming into your garden: cats' territories do not necessarily conform to our garden or house boundaries and a cat will want to patrol round areas that he perceives as his own territory. If you know the owner of the other cat, it may be possible to arrange a 'time-share' system whereby your cats are allowed out at different times of day and hence do not meet each other. Sometimes cats are wary of going out through a cat flap because it is very open and exposed on the outside and they feel vulnerable to attack. Providing your daughter’s cat with some 'cover' such as some plant pots, just outside the door may be enough to help him to get outside safely. If your daughter’s cat is very fearful, and the other cat is coming into the house, it may be best to temporarily close off your cat-flap to prevent them coming in. This will make your cat feel much more secure within the house. In this case, you will need to make sure that your cat has lots to do inside - enriching the environment with toys, climbing frames, hiding places and puzzle feeders will make staying inside more fun. Hi, our youngest cat is a 3yr old neutered male. We rescued him at only 6 weeks old, he had love, worms and fleas, and a wound on his throat that has left him with a very quiet voice! He's a Russian blue, and had been with his own ers for 2 weeks when they rehomes him as he was food aggressive and peed everywhere. It took a long time to get him back to full health, and he is now perfectly healthy. However, he's always been anxious and jumpy, not wanting a lot of attention. For the last 2 months he's reverted to spraying and seeing everywhere, not just at places of entrance, but even finding specific objects to pee on on tables, kitchen work tops and shelves. It's gotten worse over the last week, as has his aggression to our dog and the kids. We have a microchip specific cat flap, use feliway, have been playing with him more and it's not making any difference. Its almost a full time job keeping up with cleaning the curtains, doors and floors as well as protecting the dog and kids from him. He's always had some behaviour quirks, but it's almost like he has a psychological problem. He loved hugs, he sits up and puts his paws over your shoulder and wants to be held, but now he doesn't want that any more. He tries to bury left over food in the house, attacks feet and ankles, and we are at our wits end. There isn't any obvious physical health problems, nothing in the house has changed, and we've tried everything we can think of to help him. We don't want to rehomes him as it's the last thing he needs. But if this aggression to the kids and dog as well as the peeing carry on I genuinely don't know if we can keep up the work it takes to have him. Can you offer an unwanted black cat a home?